Researchers from Sandia National Laboratories have discovered a mechanism by which Rift Valley fever virus (RVFV) hijacks the host machinery to cause infection. This mechanism offers a new approach toward developing countermeasures against this deadly virus, which in severe human infections causes fatal hepatitis with hemorrhagic fever, encephalitis and retinal vasculitis. The results are reported in a paper recently published in the Journal of Virology. The work was funded by Sandia’s Laboratory Directed Research and Development program. Little is known about the fundamental infection mechanisms and interactions between bunyaviruses, such as RVFV, and their host cells. 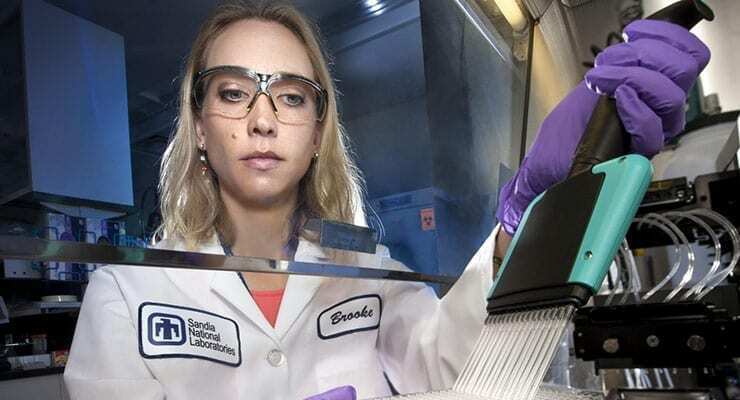 Sandia virologist Brooke Harmon and her team discovered Wnt, a signaling pathway which regulates critical cell processes, such as proliferation and differentiation, is essential for bunyavirus infection. The Wnt signaling pathway is already under heavy investigation by medical researchers because of its association with breast, melanoma, prostrate, lung, ovarian and other cancers and with Type II diabetes. Clinical trials are underway for cancer treatments targeting the Wnt pathway. “We can take advantage of the work on cancer therapeutics. Inhibitors of this pathway are already being developed for several cancers. As those therapies move through clinical trials, we can apply them to infectious diseases,” said Harmon. RVFV is listed as a National Institute of Allergy and Infectious Diseases Category A Priority Pathogen, meaning it poses the highest risk to national security and public health. Today RVFV predominantly affects animals, livestock in particular. Like most viruses transmitted by mosquitos, RVFV circulates predominantly in wild animals but has the potential to spill over into human populations, similar to avian influenza and West Nile virus. While endemic to Africa, RVFV has spread to the Arabian Peninsula and has the capacity to emerge into further territories. Since the late 1990s, large-scale RVFV outbreaks in eastern and southern Africa, Mauritania, Saudi Arabia and Yemen have severely affected the health and economy of tens of thousands of humans and infected hundreds of thousands of livestock. Harmon and Sandia researcher Oscar Negrete began the project about five years ago by using high-throughput RNA interference to screen the entire human genome against RVFV. The researchers looked for genes that were required for virus infection, meaning that the virus cannot infect cells missing that gene. From that initial screen, conducted at the University of California, Berkeley, and further screening at Sandia, they narrowed the field down to 381 genes of interest. “When we functionally clustered those genes, we found that the Wnt pathway was the most represented,” said Negrete. To test their hypothesis that the Wnt pathway is critical to RVFV infection, the researchers tested a vaccine strain of the virus. When those results supported their theory, they conducted the same experiments on wild type virus in a Biosafety Level-3 laboratory at Lawrence Livermore National Laboratory. They expanded the testing to other members of the bunyavirus family like La Crosse virus and California encephalitis virus and found the same results. “This was somewhat unexpected because divergent bunyaviruses typically have their own unique features of infection. The fact that they shared this same pathway is exciting because it indicates Wnt signaling may be necessary to the virus family as a whole,” said Negrete. The next step, said Negrete, is to further investigate the mechanisms of infection. The researchers also plan to look for other mechanisms of RVFV infection using CRISPR, or clustered regularly interspaced short palindromic repeats, which is complementary to RNA interference. This understanding can aid in the design of effective host-directed anti-viral therapeutics. Read more: A Genome-Wide RNAi Screen Identifies a Role for Wnt/Beta-Catenin Signaling During Rift Valley Fever Virus Infection.